This page is in the process of being populated with descriptions of condo complexes. The Sea Village is a popular condominium complex located about one mile south of the Kailua pier. Built in 1974, the complex has 132 one and two bedroom units in five buildings. Ample parking is available around the complex. Most units are individually owned but Vacation Internationale owns about 50 units. About 140 of the units are active vacation rentals with only a few owners not renting or living in their unit full-time. The one bedroom units are approximately 700 sq ft and two bedroom units average 967 sq ft. Basic services such as water, sewer, garbage, cable TV and wi-fi are included in the monthly AOAO fees. Owners have their own HECO accounts for electricity. Other amenities include the pool and hot tub, a garden area with gas BBQ grills and picnic tables. The Sea Village has a proactive AOAO board and a fully funded reserve account. The Village has solar PV adequate to supply virtually all of the electricity use for the common areas, pool and hot tub. An on-site manager and full-time assistant plus part-time office manager take excellent care of the property and perform routine maintenance tasks. 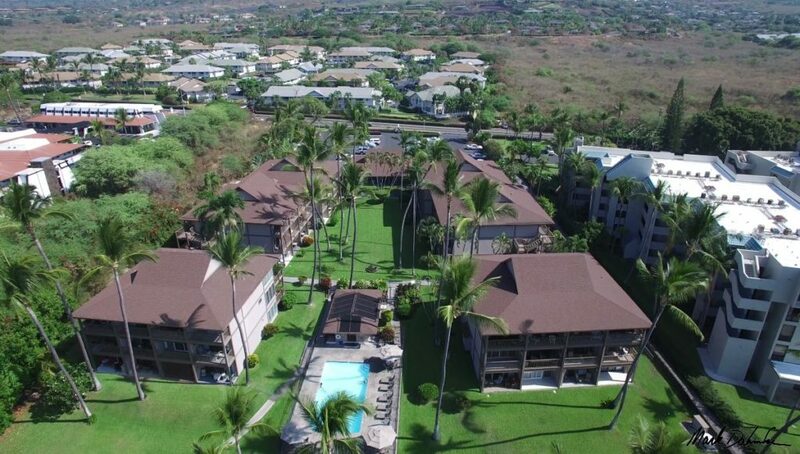 Kona Isle is an ocean front condominium complex popular with vacation renters. Located about two miles south of the Kailua pier on the makai (ocean)side of Alii Drive. Alii Drive runs for 5 miles between Kailua-Kona and Keauhou-Kona. Both Kailua and Keauhou have shopping centers and 8-plex theaters, grocery stores, shops & restaurants. Kailua has several different big box and home improvement warehouses including Macy’s, Costco, Home Depot, Lowe’s, Target, K-Mart & Office Max. The Crossroads Center is home to the largest Safeway grocery store in the state. Kona Isle was built in 1973 and has been meticulously maintained ever since. Best known for its lush tropical landscaping and large manmade beach with picnic tables and barbeques. Large pool with bathrooms & showers front the lush lawn between the pool & the ocean. Next door is the famous “Secret Pool” on the ocean (shown in the photo of Kona By The Sea which is next door). Ample parking is available in front of the complex. All 75 units are individually owned. Rentals must be for 5 days or more; which is perfect for vacation rental. I rented unit D-1 for six months in 1989 while I was building my house up mauka and I loved it. Monthly Association Of Apartment Owners (AOAO) maintenance fee includes water, sewer, trash pick-up, basic cable, maintenance of the grounds & pool area insurance for the common areas and apartment for the resident manager. The lush tropical landscaping and the entire complex is well maintained by the association and there is an on-site manager for your convenience. Alii Lani is a popular condominium complex located about two miles south of the Kailua pier on the mauka (mountain) side of Alii Drive. Alii Drive is a 5 mile stretch of mostly condominium complexes and some ocean front homes between Kailua-Kona and Keauhou-Kona. Both Kailua and Keauhou have shopping centers and 8-plex theaters. Kailua has several different big box and home improvement warehouses including Costco. Alii Lani was built in two phases by Stanford Carr Development. Phase 1 was built in 1996 and phase 2 was completed in 2000. Phase 1 and 2 have separate pool and recreation areas. Phase 2 pool has an additional kiddie pond. The complex has 367 unit in 43 buildings. There are 260 bd/2ba units ranging from 723sq.ft. to 787sq.ft and one 996sq.ft. 2bd/2ba unit and one 1,620sq.ft. unit. There are also four 687sq.ft. 2bd/1ba unit and two 729sq.ft. 2bd/1ba unit. There are 95 3bd/2ba units ranging from 897sq.ft. to 976sq.ft. Ample parking is available around the complex. All the units are individually owned with approximately 28% being owner occupants. There is a 30 day minimum rental period which mean you can rent to one family for 30 days or more or one family per month for 1 to 29 days. The complex is in high demand by long term renters. Alii Lani is a cat friendly complex allowing one cat and/or one bird. Monthly Association Of Apartment Owners (AOAO) maintenance fee includes water, sewer, trash pick-up, maintenance of two pools and two BBQ areas, exterior insurance, landscape upkeep, annual interior inspection with fire/smoke alarm batteries replacement, exterior pests control, maintenance of two parking stalls. 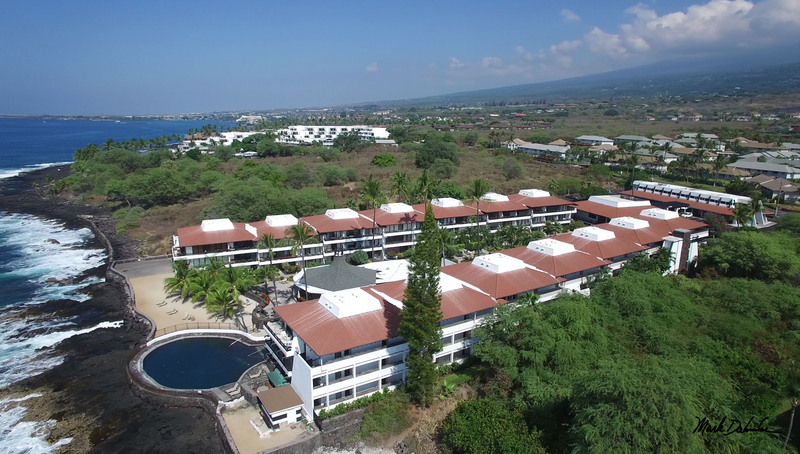 Casa De Emdeko Condominiums are very popular with vacationers traveling to Kona. Located about two miles south of the Kailua pier on the makai (ocean) side of Alii Drive. Alii Drive is a 5 mile stretch of mostly condominium complexes and some ocean front homes between Kailua-Kona and Keauhou-Kona. Both Kailua and Keauhou have shopping centers and 8-plex theaters. Kailua has several different big box and home improvement warehouses including Costco, Kmart, Walmart, Target, Lowe’s, Home Depot, Macy’s, Office Max and the largest Safeway grocery store in the state. Kailua also has KTA and SackNsave grocery stores plus Long’s Drugs. Keauhou has a KTA and a Long’s. All the shopping centers have numerous shops and restaurants. Kailua has the famous ocean front Boardwalk with more shops and restaurants. Between the Boardwalk and Kailua Pier are numerous other shops and restaurants on both sides of Alii Drive. The Pier is home to the world famous Hawaii International Billfish Tournament ( http://hibtfishing.com/ ) and the starting point for the one and only World Ironman Triathlon ( http://www.ironman.com/triathlon/events/americas/ironman/world-championship.aspx#/axzz4wHhUpANO ). Casa De Emdeko was built in 1970, has gone through several upgrades since then as well as having been meticulously maintained by the associations maintenance crew over the years. There is a nice water feature running from just below the lobby to the upper pool (not shown). There is another swimming pool on the ocean and a man-made sandy beach for you sun worshipers. Large covered entertainment pavilion with cooking facilities available for large parties by reservation. Of course you can sit in the shade there any time without a reservation. There are 3 barbeques just outside the pavilion on a concrete picnic area between it and the man-made beach. Up front is a large, open lobby area and under the lobby is a large room with coin operated washers and dryers (although most units have washers and dryers in them). There is also an area for washing cars. Monthly Association Of Apartment Owners (AOAO) maintenance fee includes: electricity for the air conditioning condenser units on the roof, basic cable, quarterly pest control, trash pickup, hot water (considerable savings on your electric bill), sewer, water, on site property manager, roaming security, maintenance for the two pools, beach area, BBQ area, cabana, lobby, stairs, elevators and parking lots. The lush tropical landscaping and the entire complex is well maintained by the association and there is an on-site manager for your convenience.